Abu Dhabi: UAE’s Khalid Al Hajeri clinched gold in Shotput M14 category with a throw of 10.98 metres at the Special Olympics World Games on Sunday. Finishing second was Puerto Rico’s Alezander Almenas with 10.31 metres while Konstantinos Trigazis of Greece claimed bronze with a throw of 9.68 metres. “This is a proud moment for me as I have always dreamt of winning gold medal for the UAE. I have honoured my country by winning my competition which was very difficult as there were some strong competitors there. But I always felt confident and had high spirits and I’m pleased to have won,” said a jubilant Al Hajeri, who went on to add that he enjoyed the most by making friends with athletes from around the world. UAE are on a haul of 26 golds, 23 silvers and 35 bronze at the time of going to press. India, meanwhile, have consolidated their position in the medals tally with 164 medals including 45 golds, 52 silver and 67 bronze on Sunday. India’s table tennis players stole the show with five medals — four gold and silver. 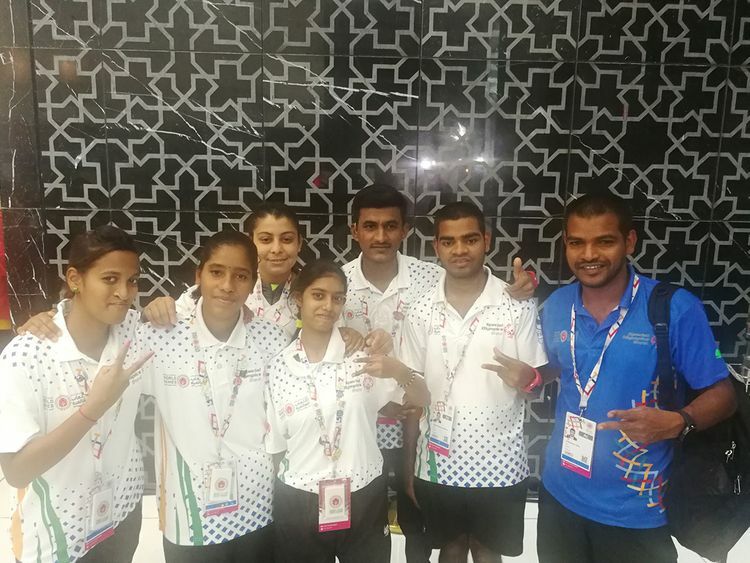 Sabita Yadav, Anu Chennekota won gold in the women’s category while Sandesh Krishna Harikantra and Akash Tukaram Akoskar won gold in the men’s category. The silver medal was bagged by Reshma Shaikh. “Sandesh has been with me for the last five years and Akash don’t train under me continuously but I train him during the competitions. The girls are also from different state and they have also been exceptional as you have seen,” said coach Cyril Salu Lopes, who rated the success to the tight selection trials they have conducted ahead of the event. “The first participate in district, the state and nationals. After that we had five pre-preparatory camp in which we had 1000 kids and from that it was reduced to 500 and 300 before selecting five best who are here. Hence this is the best ever show. All these players are participating in their first Special Olympics and to get such a result is phenomenal,” felt Lopes. Earlier in roller skating, Supreet Singh from Haryana, and Rishabh Jain from New Delhi won a gold each in 1,000-meter while Priya Prakash Gada from Maharashtra won gold in 100-meter. Amanjot Singh won gold in the squat competition with a lift of 385kg. Indian roller skaters bagged a whopping 29 medals comprising nine gold, 13 silver and two bronze. The powerlifters of India also found the podium 23-times by the end of the second day of competitions. The cyclists claimed two gold while the judokas brought in two more gold medals. The athletics and swimming contingents, who are competing in Dubai, were also successful in winning eight medals. Victor R Vaz, national sports director of Special Olympics Bharat, has revealed that the federation will request the India government to give jobs for all medal winners and health insurance for lifetime. “When an able athlete wins medal, they are assured of Rs500,000 to Rs1 million (Dh26,000 to 52,000). We are just asking for job security and health insurance which is reasonable. Air Marshal Denzil Keelor, founder Trustee and CEO of Special Olympics Bharat, will also be making an official request soon. Hopefully, it will be done,” added Vaz.